The most easterly city in Canada, St. John's, blankets the hills and steep slopes that spill down to the harbour. It is a flourishing area, full of character and charm, and is Newfoundland and Labrador's economic and cultural heart. 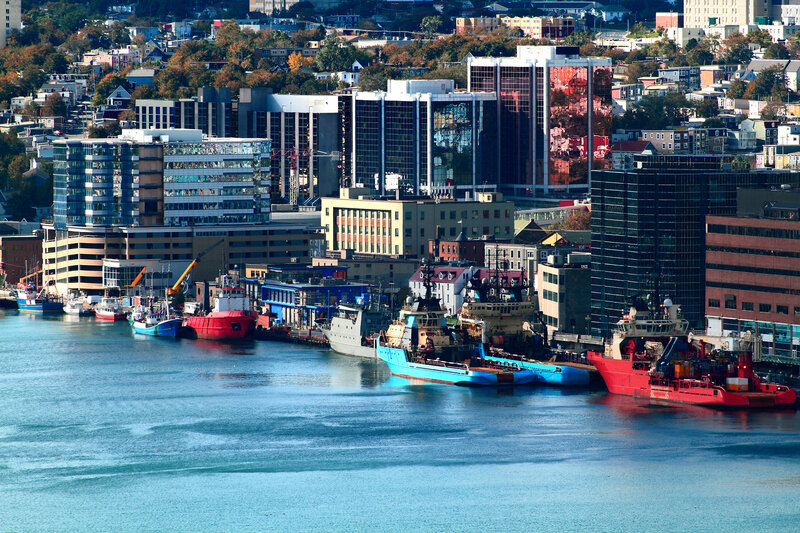 As a city of over 100,000 people, St. John's has everything you need. Convenience, shopping and a complete array of services are right there. There is a full range of real estate possibilities in St. John's: large executive homes, downtown condos, single family properties in quiet subdivisions. Real Estate Prices In St. John's, the average price for a single-detached new home is currently just under $400 000. For more information on homes in St. John's, don't hesitate to contact our group. We can answer any question you may have about buying a home in St. John's. Shopping There are several major shopping districts in St. John's. Kelsey Drive, off Kenmount Road, offers a number of big-box options. The Stavanger Drive area, off Torbay Road, is a huge retail area hosting many of Canada's top chains, as well as restaurants. There are two shopping malls, Avalon Mall and the Village Mall, as well as various strip malls. Downtown has many specialty shops and boutiques that, combined with the many restaurant options there, make for a great afternoon out. Getting Around St. John's is best travelled by car: commutes are reasonable compared to some cities, traffic jams are rare within city limits and it's not uncommon to find drivers that are courteous, stopping to help other drivers enter traffic. There are some odd intersections and one-way streets to watch out for downtown where streets tend to follow wagon tracks created a very long time ago. It really does add to the uniqueness of downtown. There is a public transit system: Metrobus. Walking around St. John's, however, can be a bit challenging in the winter months due to snowfall amount. There are some cyclists, but not many. Cyclists should exercise extra caution. Climate St. John's has a temperate climate, with no extremes in temperature. Winter is relatively mild, but quite snowy, and summer isn't hot. Known affectionately as Fog City, St. John's is the foggiest Canadian city and one of the windiest. That may be the reason why the people of St. John's turn to art, music and pubs! Arts, Culture & Fun St. John’s has a reputation as a cultural and arts centre. There is a thriving theatre community, and many venues to catch live music, especially on famous George Street, with its 23 bars. Find big-act concerts and hockey games at Mile One Centre, take in shows at the Arts and Culture Centre and The Resource Centre for the Arts. Enjoy the many festivals and North America's oldest regatta in the summer. Recreation St. John's has 43 parks and 125 kms of walking trails. The 265 km East Coast Trail, at a world class hiking standard, runs past St. John's. There are a number of public swimming pools, with a number of those swimming pools operated by the City. There are 124 playgrounds, 44 sports fields, and 33 basketball and tennis facilities. There are private gyms, martial arts schools, indoor rock climbing, dance schools, and so much more. You can even cross-country ski within city limits! The links below provide excellent information on the schools serving St. John's. Use the School Catchment Viewer to find the schools zoned for any area in St. John's. École de Grands-Vents serves the French speaking population.